What I'm about to begin is a 6 week challenge, this time not by choice but by accident. About 4am on Friday 21st March I slipped down stairs with our new cat Sox. She had a little accident in the bedroom and I didn't want her to have a bigger accident. However in my mad panic I slipped on the last two steps of the stairs and went flying. Sox was fine. I, on the other hand, sprained my ankle and broke my 5th metatarsal (little toe). At the time I knew I had done more damage than usual. I'm a dab hand at spraining my ankle, but the pain on the right outside edge of my foot was a new thing. I went straight to bed knowing I would be calling my Dad first thing to take me to casualty. Funnily enough this isn't the first time I've had that sort of conversation. In 1991 I had to ask my housemate to take me to casualty after going over my ankle in a nightclub. At least I got away with a badly sprained ankle and no broken bones. This time was my 6th time in casualty and the second time I've broken a bone. Salford Royal Hospital was excellent. I only had to wait under an hour to get seen to and was told off for not taking painkillers. To be honest I was in more pain with a bad sprain in 1991 than a broken foot in 2014. I knew things weren't good when the Doctor chased us down the corridor after the x-ray and ushered us into a cubicle. I overheard the word metatarsal being mentioned from the nurses station and knew the news would be bad. Before I knew it I was up in the plaster room getting plastered, but not in a good way. 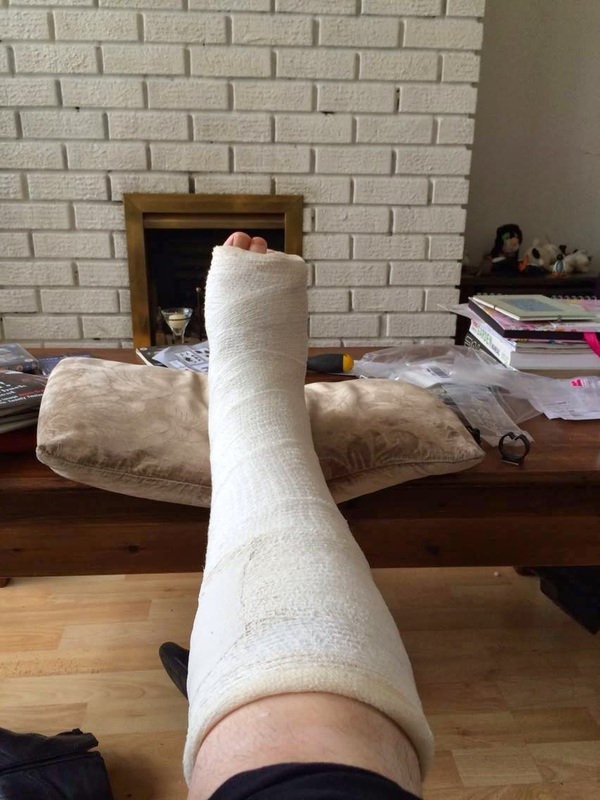 So I left hospital with a broken 5th metatarsal, crutches and an appointment for the fracture clinic on Monday. It has been a shock to the system to be completely immobilised. The initial cast was a non-weight bearing cast and it was a b*tch to get about. I have to admit I cried at one point through frustration. My car is stuck in the drive as I can't use my foot to break or accelerate. Since I started driving the longest I've been unable to drive is two weeks because of staples I had in my neck after a removal of a thyroid tumour. Thankfully at the fracture clinic they gave me an aircast instead of a full leg plaster. It was an easy decision to make as the other option of a full leg plaster involved warfarin injections for DVT. 1. Despite Lil'Sox getting me into this situation, she's a loving, good natured little cat. She even won over my Mum, who had been traumatised by my first cat Sooty. Sooty was an unneutered tom cat who had trouble written over his face - the fights, the fleas and the regular impregnation of the local lady cats. I loved him, but he loved my Dad the best. 2. I have learnt to type with a cat lying on my arm. 3. I find it easier to go down stairs than upstairs on crutches and as a result have excellent bladder control. 4. Tesco's home delivery service is the new home help service. They were really accommodating by helping me put stuff away, whilst making sure Sox didn't escape out the front door. 5. My parents and Neil are super stars and have really helped me out. 6. Daytime telly is not an option. It's a slippery slope I'm not willing to fall down. Maybe an episode from a series I'm following, but no more. 7. I now have a daysofa (2 seater) and an evening sofa (3 seater) to help me differentiate the day. 8. There is little you can do to fight a broken foot. You just need to go a little Zen and accept the situation and make the best of the time you've now got. 9. Being able disassociate from the fact my foot feels like it's burning in a stormtrooper like cast. Sleeping in it is not much better. 10. Watching a cat skid long on laminate flooring during her mad half hour is hilarious. Almost as good as waiting her panic when she thinks she is stuck on top of a cupboard. Honestly I don't recommend you break a foot, however cat ownership is fab and endlesslessly entertaining especially when convalescing. Has your leg tottaly healed?Hope you feel better and dont have any pain.